• Approved, 3-0, the Ditges Exemption. It allows a family with approximately 40 acres to section off 5 acres from the entire property. Those 5 acres would be owned mutually by the whole family and function as a recreational picnic and camping area. • Approved, 3-0, a resolution of nondiscrimination based on disability. Moffat County Commissioner John Kinkaid expressed distaste for the resolution. It was a requirement by state funding agencies such as the Department of Local Affairs, which is funding the Shadow Mountain project that’s updating the water/sewer lines and roads of the subdivision. Moffat County Commissioner Chuck Grobe said it should be approved because it wouldn’t change county operations whatsoever, since they already don’t discriminate based on disability. • Approved, 3-0, an application for assistance from the Colorado Drinking Water Revolving Fund for the Shadow Mountain Village project. Approved, 3-0, a resolution to use Drinking Water Revolving Fund money for the Shadow Mountain Village project. 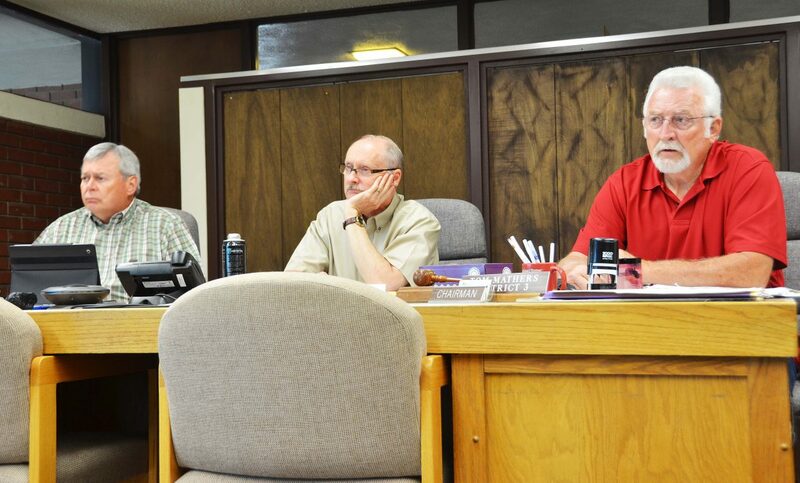 • Approved, 3-0, “fire bank” hours for Moffat County Sheriff’s Department. It would allow officers on call and on standby to log their hours. • Discussed the “pets in the workplace” county policy. Lynette Siedschlaw said employees had requested that the Board of County Commissioners consider exempting fish and sea monkeys from the no-pet policy. The BOCC said that they wouldn’t provide any exemptions. • Reviewed the monthly reports from the Road and Bridge Department. Bill Mack, of Road and Bridge, said, among other things, they were working on washouts and mudslides in Wilderness Ranch and crack failing at the airport and Moffat County Fairgrounds. • Reviewed a bid recommendation for a motor grader for the Road and Bridge Department. Since only one bid came in, the board asked to redo the bid process so more businesses could make offers. • Discussed repealing the ordinance against the sale of recreational marijuana within county limits with Kris Brannan, owner of Nisbeth Gardens. The board said that after the June primaries, it would consider either repealing the ordinance, putting it to a vote or not repealing the ordinance. Moffat County Commissioner Tom Mathers said he was open to putting it on the ballot. “We’re not going to lift the ordinance, probably. We’re not going to change that,” he said. “But we could put it on the ballot one more time.” Grobe was more resistant to the idea and said the county should wait until things settle down, more data comes in and more regulations are put in place.